What’s the biggest news about the recent update to Pages, Apple’s word processing and page layout application for you iOS device? It’s that the app has gotten quite small. While Apple has tweaked the app so that it’s a bit easier to share files and change fonts, the biggest change to Pages is that it now works on your iPhone and iPod touch in addition to your iPad. It’s hard to imagine using Pages on an iPhone or iPod touch—that is until you actually give it a go. While most writing tools for these devices tend toward the well-designed-but-minimalistic—think Elements or PlainText—Pages offers up a fairly complete collection of page layout and word processing features without making you feel like you’re trying to create an entire universe on the head of a pin. While I don’t think anyone will be writing term papers or full length articles on an iPhone, Pages on these smaller iOS devices works surprisingly well. Turn the Page: While the idea of page layout and word processing on your small iOS device seems impossible, Pages makes it easy for you to work with images and text on your iPhone and iPod touch. What makes Pages a worthwhile writing tool on a small iOS device is a feature Apple calls Smart Zoom. What Smart Zoom does is zoom in on the text that you’re editing while you’re editing it, then zoom out to give you a full view of your document when you’re done. When you’re using Smart Zoom, Pages is able to display about ten lines of text and about 40 characters depending on the size of the font you’re using. I found this to be sufficient for most of my editing needs, making the text large enough for me to easily read as I typed, while at the same time keeping several sentences on the screen so I could maintain the context of what I was writing. Unfortunately, while it’s possible to work in landscape mode on the iPad, you can only work vertically on the smaller devices. In terms of features, Pages on the smaller iOS devices offers up everything that you’ll find when using the app on the iPad. There are differences in the way the apps look: The iPad version offers up a full menu bar with with a new button for changing fonts as well as the other formatting tools that have always been available in Pages, but the smaller version, due to the size of the screen, has to keep these tools hidden until you need them. So, to change paragraph styles and text formatting on the iPhone, you first have to select the text that you want to change and then tap the small Info button that appears in the menu bar. When you do, a small window appears below your selected text that, like the iPad’s tool bar, allows you to make all the paragraph and style adjustments that you want to. Tweak Your Text: The updated Pages on the iPad gives you easy access to more text formatting tools right from the toolbar. Adding images, tables, graphs, and other objects to your documents on the smaller iOS devices is very easy, although I did find that pictures were super-sized when I first inserted them—so big, in fact, that they were a pain to resize. Tables, graphs, and shapes were handled in a much more graceful fashion. Once inserted, all the objects offer a number of formatting options from drop shadows and frames to colors and embedded text. As your document grows in size you can drag your finger along the right-hand side of the page and a small magnifying glass appears displaying a thumbnail of your currently selected page and its page number. Dragging your finger up or down lets you quickly navigate to any page in your document. While working with the app I created, shared, and opened documents using Pages on the iPad, iPhone, and my Mac. Formatting and images stayed in tact no matter where I was editing it. While the documents looked and worked the same, though, attempting to share the documents across all of these devices reveals Page’s real achilles heel. Quite simply, getting your documents from where they are to where you want them is too difficult to be worthwhile. While all the iWork for iOS apps have added support for WebDAV in addition to MobileMe and iTunes file sharing, there is still no support for true file syncing. No Dropbox support, no syncing with your DropDAV account or MobileMe—nothing but manual file sharing between every version of Pages that you’re using. This, for me, makes an otherwise wonderful page layout and word processing application a complete non-starter. As I said in an earlier review of the mobile edition of Pages, it still feels like a boutique application that shows off the amazing capabilities of the iOS. Thankfully, Apple's fall release of iCloud will mitigate most, if not all of what's wrong with document sharing on iOS, but as of now Pages still remains impractical for real work. 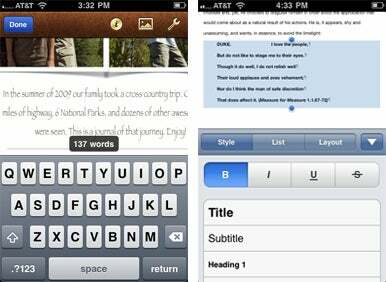 Pages 1.4 is an amazing word processing and page layout application made more amazing when you realize that all of this power is packed into a device that can fit inside your pocket. While it needs true file syncing to make it truly great, as a standalone application for your favorite iOS device, Pages is a very impressive app.